From the Hancock County Courthouse, go north on Hwy 15 for 2.7 miles. 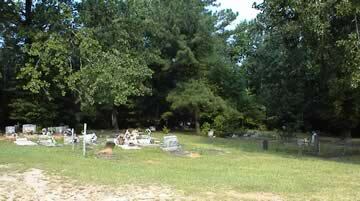 Turn right on Hwy 22 and proceed 3.2 miles to the cemetery behind the church on the left side of the road. The New Beulah Baptist Church was founded by Rev. Sam Bird in 1871. The first sanctuary was erected in 1891. Over the years, additional land was purchased and a new sanctuary was erected, where services were first held in 1986. The earliest marked grave in this cemetery is 1903. The graves are numbered starting in the far left, back as you face the cemetery. The rows go from left to right, coming forward in the cemetery, with the last grave located at the right front of the cemetery. Graves numbered 300 or higher have been added since the original survey and are believed to be somewhere in the cemetery. 72 years old. All info from funeral home marker. Age 52. All info from funeral home marker. Death day could be 6. Hard to read. 3 graves, with first one broken. "Muddear" We haven't forgotten you. We love you. Your nine will meet you in the upper room. 75 years 10 months 25 days. All info from funeral home marker. Age 30 years. Date and age per Kimbrough list. Gravestone is broken and has been moved from its original position. One grave has headstone with "Memory of" with no name. Two adult slabs. One grave. Age 72. All info from funeral home marker. Difficult to read. Georgia Pvt 514 Engr. Service Bn. "Grandmama" The Lord giveth and the Lord taketh away. Age 78. All info from funeral home marker. Name spelled as "Castle" on one line and "Berry" on the next line. Info from funeral home marker and difficult to read. Age 65. Asleep in Jesus. 72 years old. All info from funeral home marker. Dates are unreadable. Year may be 1936. Difficult to read. A faded funeral home marker on grave. 89 years old. All info from funeral home marker. One unmarked grave and one adult slab. 71 years old. A symbol that looks like a feather is on the slab. Info from funeral home marker. I'll always be in your heart. Only one date on stone. Infant grave. Not found in 2003. Name per Kimbrough list. Age 16. Not found in 2003. All info from Kimbrough list. Age 60. Not found in 2003. All info from Kimbrough list. Age 70 years. Not found in 2003. All info per Kimbrough list. Age 12. Not found in 2003. All info from Kimbrough list. Age 24. Not found in 2003. All info from Kimbrough list. Age 87. Not found in 2003. All info from Kimbrough list. w/o Mose(s) Charleston. Grave to be marked sometime after July 2004. She is buried somewhere in this cemetery. Grave is in the woods. Gravestone in pieces and is in the woods. 7 graves in the woods. Infant. All info from obituary. Age 59. All info from obituary. Age 2. All info from obituary. Age 3. All info from obituary. Age 96. All info from obituary. Age 47. All info from obituary. Age 25. All info from obituary. Age 46. All info from obituary. Age 7. All info from obituary.